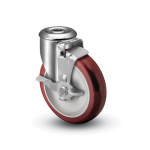 Top Lock brakes are available on Colson 2 Series, 2 Series Stainless, 3 Series, 4 Series, and 4 Series Stainless casters. of wheels. A special cam activated brake mechanism locks firmly and is easy to engage and disengage. To order the brake with a caster, specify “BRK1”. Capacity up to 325 pounds each. Constructed of polished stainless steel, Colson’s 2 Series Stainless Steel Top Lock brake provides positive, reliable braking under a variety of harsh operating conditions. Compatible with 2 Series Stainless Steel swivel kingpin forks only. To order with a caster, specify “BRK1”. This brake is not recommended for high-temp applications. Capacity up to 800 pounds each. 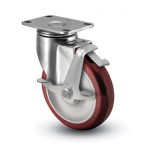 Available with all swivel casters in the 3 Series line. 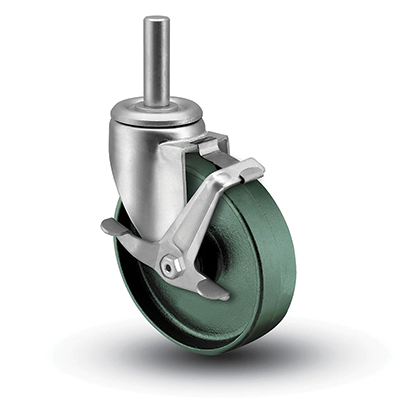 Colson’s Top Lock brake gives positive braking action on all types of wheels by engaging a rubber brake shoe directly against the tread surface of the wheel. A self-compensating spring maintains the effectiveness of the brake throughout the life of the wheel. Thread guards can also be used with this brake. The brake pedals are rugged .090 steel & zinc plated. To order on a caster, specify “BRK1”. Capacity up to 1,250 pounds each. Colson 4 Series forks include a special notch for easy installation of Top Lock brakes. 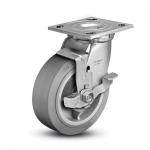 The brake is cost effective and provides reliable braking under a variety of operating conditions. 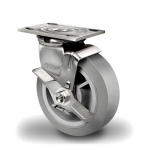 Colson 4 Series Top Lock brakes are available on 4 series casters except models with 3 1/4″ or V-Groove wheels. To order it with a caster, specify “BRK7”. Capacity up to 1,250 pounds each. Constructed of polished stainless steel, Colson’s 3-piece 4 Series Stainless Steel Top Lock brake provides positive, reliable braking under a variety of harsh operating conditions. 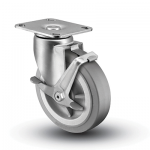 The brake is compatible with 4 Series Stainless Steel swivel forks only. To order this brake with a caster, specify “BRK7”.